We currently have 170+ lines in the nursery, with five lines out on the reef and one line was donated to the Four Seasons to help kick start their coral project after the bleaching wiped out most of their colonies. Now that the bleaching has ended we are planning to transplant lines out onto the reef in the coming months - some lines have been held in the nursery for 2 years now and are becoming so big that the nursery is at risk of collapsing! July will be the perfect time to move lines onto the reef, after we have completed our initial tests in June to see which sites are most suitable for transplanting. These new lines will rejuvenate the reef and provide an important habitat and food source for a lot of coral dependent animals. Our house reef sustained a lot of mortality and coral cover is now very low. As with any ecosystem, when the food source becomes limited, coral eating animals are likely to focus on a new bounty of food if it becomes introduced and for this reason we are planning to move a three coral lines together onto the reef at one time, this will minimise the predation on individual lines. Read all about the coral bleaching and how it has affected our coral lines nursery so far here. The graph below shows us that despite the increase of new fragments in the nursery, the number of colonies alive remains the same. This is due to both bleaching and coral predation from predators. We hope to see an increase in the number of fragments alive in the following months. Using ~19 species (some we still cannot ID to species level), 7848 fragments have been planted to date, with 5379 still alive today, which gives us a 68% survival rate. This is obviously significantly lower than our previous reports of survival which have averaged about 85% over the first year and a half, but considering the mortality on reefs in the Maldives as a result of the coral bleaching, we had feared our survival rate would drop very low, which it has not! The number does include lines which have just been planted though, which falsely improves our data with 100% survival for those lines. 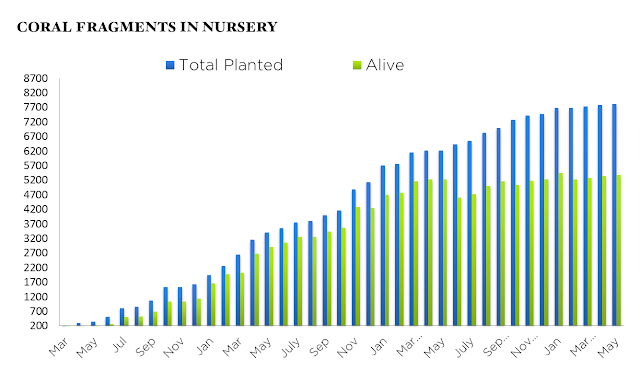 If we take into account only those lines which have been in the nursery for 3 months or longer, and therefore have been monitored at least once, we get a more accurate 66% survival rate. Before the bleaching event, mortality was generally as a result of disease, but the increase in water temperature was the primary determinant of the recent mortality increase. Using our data, we can start to see which species might be the most resilient to diseases and future warming events, and which species are not the best choice for this method. Our results so far show us that A. digitifera has a particularly high mortality rate (71%) and we have consequently not planted any more of these, as opposed to species like Pocillopora damicornis which has a very low mortality rate (only 1/139 died). Every three months after planting a line, we measure the widest point of the coral fragments to determine a measure of growth rate. Here, we group that data per species, not per line. With four lines of A.aspera being so large (more than 20cm per frag), growing at an average rate of almost 5cm every three months, it is clear that this species is a front runner when it comes to speedy growth. 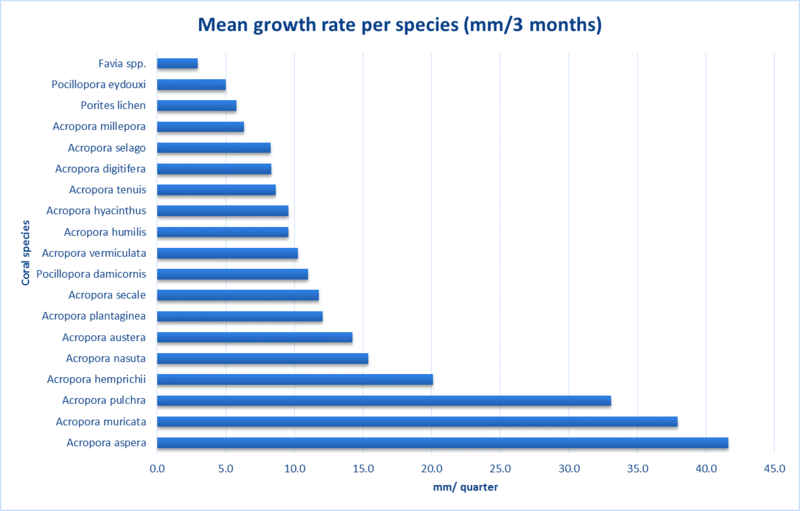 However, this fast growth seems to come at a price; we have found the quicker growing species favour growth rate instead of strong skeletal structures and it would appear that the energy used for growth compromises the energy used for their immune responses. In other words, fast growers break easily and are more susceptible to disease. Species such as A. aspera and A. muricata are plagued by White Syndrome- a bacterial infection which caused partial, if not full mortality in many fragments in October of last year. You'll notice a third staghorn species; A. pulchra. This dominant species on shallow reef flats is also a fast grower, but does appear to be more resilient to diseases. Measuring largest colony diameter with calipers is not the most accurate way to measure coral growing in 3 dimensions, and one of my favourite growers is actually Pocillopora damicornis, which extends in an almost perfect sphere. Our data shows 1cm growth every three months, but this is in all directions! Some species are ill represented here in terms of their growth due to our methods. 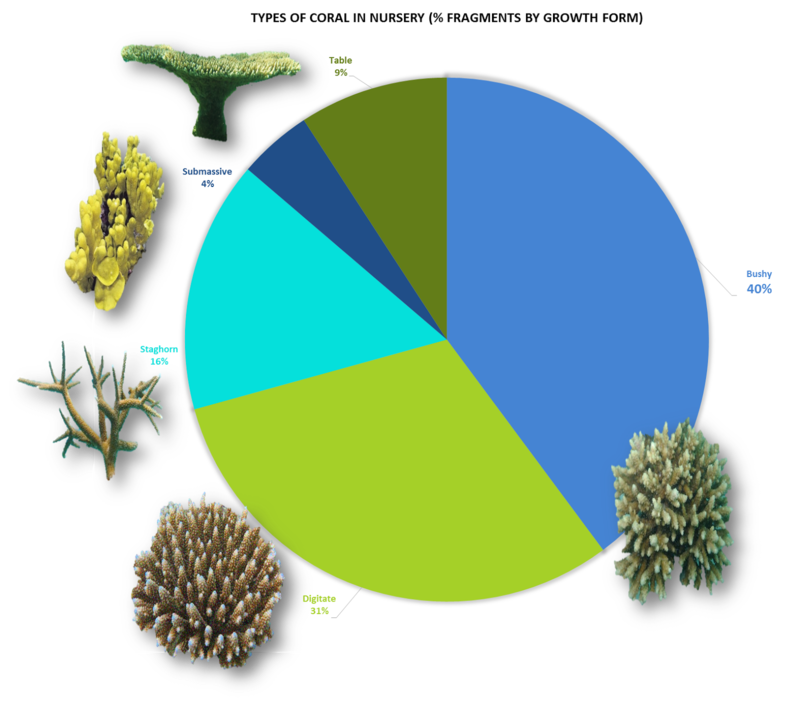 Species of coral can more simply be grouped into 'growth forms'. We are experimenting with a few different types of coral including tabular, staghorn branching, digitate, bushy and submassive or boulder like growth forms. We recently planted two more submassive lines- one Porites and one Faviid. These are more difficult to fragment than branching species, and are often not used in restoration projects, so we are excited to see how they grow. Check back on 'Growth Rates' to see the latest on the Favia species which is our slowest grower so far. We measured this coral last week, and found it is surviving well, has formed almost perfect spheres, but is expanding very slowly. We are mostly using bushy and digitate species as these are the most common forms on the exposed One Palm Island reef. 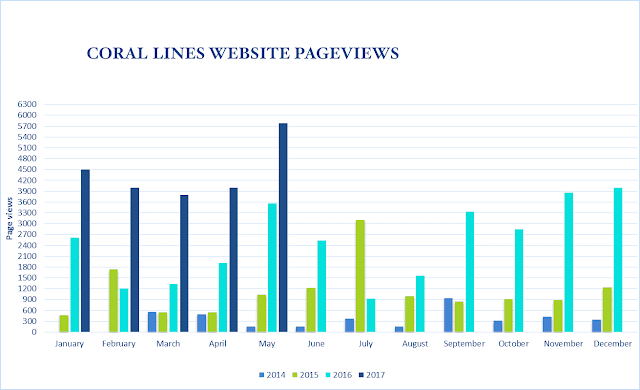 We are averaging around 4000 page views per month this year and had another spike in May with 5747 views that month! It's great to see that people are spreading the news about coral lines by sharing their line's page on social media! We have experimented by transplanting two of our oldest lines (001, & 006) onto the reef, and we need to perfect this method and start to move the others. 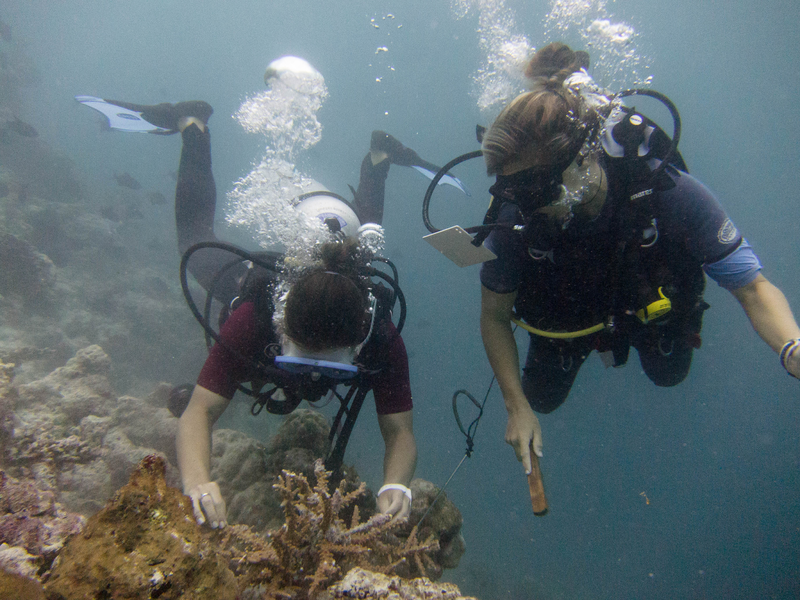 We used pneumatic drills to make small holes in the reef, and nail down the first line. This method was easy and quick, but the coral took 6 months to secrete over the dead coral substrate. Once the coral has begun to grow over the rock, we hope it will continue growing and flourish on the reef. 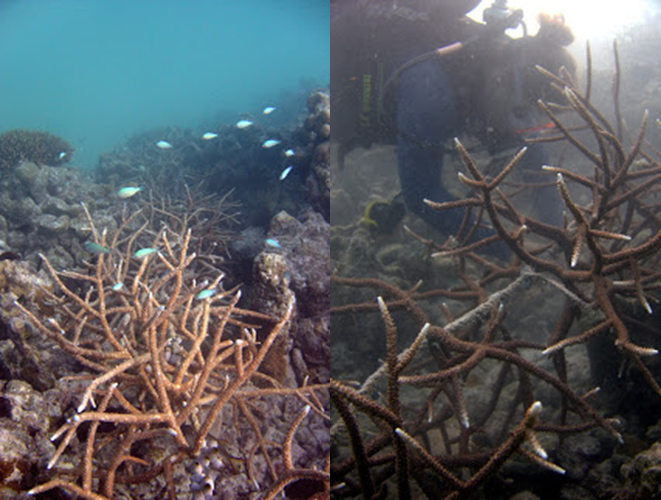 For more tricky branching species (006), we used epoxy putty to help cement the coral onto the reef. There was no chance we could get the rope close enough to the substrate with those long branches to drill, so epoxy was the best way to go. Initially the coral experienced some patchy bleaching due to the stress of being moved, and one month following transplantation we could see some mortality, and what we thought was disease. However, upon closer inspection, we determined these legions were in fact feeding scars, and we later found a large number of Drupella snails feeding on the coral at night. This is normal - where a large amount of coral is introduced to an area of low coral cover, we would expect all the coraliverous creatures to come and eat the new source of food! Most of the fragments are still growing well though, and we still occasionally pick off the snails. We will develop a new page in the coming months documenting this transplantation process. Following transplantation, some corals are growing well, and have even attracted small schools of Chromis. As mentioned earlier, because of these unfavourable environmental conditions, the poor health of our target reef and the stress that relocating lines would cause, we froze the project for a few months and stopped both making new lines. Now we make fewer lines so we can focus on transplanting lines out of the nursery onto the reef. Other immediate plans include trying to find ways to track the lines once they have been transplanted. We are also looking towards mapping the reef using GIS for this. Many of our guests have enjoyed getting involved with the challenges of our project, particularly the transplantation stage. We are constantly working hard to develop and improve our methods using current literature as well as trial and error in a bid to produce excellent scientific data which will be of publishable standard in a peer reviewed journal. As we learn, we are documenting our findings and we hope to create a user friendly manual that can be used to guide others in the field. We also plan on continuing our focus on raising awareness by planting more lines with guests, providing more information online, and sharing our findings where possible.